Rent-A-Thug: First Offence is finally here! The first Rent-A-Thug comic book arrived today and will go on sale tomorrow at the Edmonton Collectible Toy and Comic Show. The book is 36 pages of Rent-A-Thug misadventures in glorious black and white. 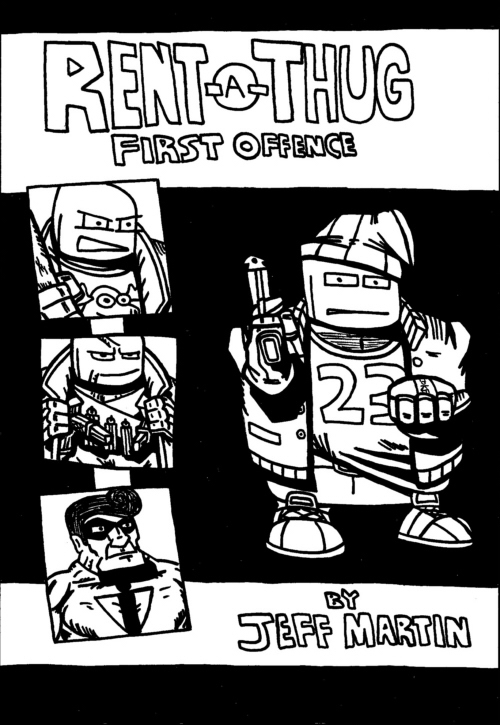 First Offence features four short stories, two of which are exclusive to the print comic! Stop by the Toy and Comic Show to pick up your copy for only $5! Buy the book, love the book, possibly make love to the book. Here’s a peek at the cover. This entry was posted on Saturday, April 19th, 2008 at 7:49 pm and is filed under Blog. You can follow any responses to this entry through the RSS 2.0 feed. You can leave a response, or trackback from your own site.